A raft of proposals aimed at clarifying the role of superintendent and responsible pharmacists has been set out by the Department of Health and Social Care (DH) programme board tasked with “rebalancing” medicines legislation and pharmacy regulation. I have been a member of the rebalancing board since its inception and represent Superintendent Pharmacists and the broader views of community pharmacy in the discussions. Yesterday I had the pleasure of running a workshop with a colleague Board member, David Gallier-Harris a Pharmacist Manager with Asda, on what the proposals will mean in practise to Superintendent Pharmacists and Responsible Pharmacists. The event was a Partners Forum held by the DH at the Royal Pharmaceutical Society Headquarters in London. The Forum is an important opportunity for a wider stakeholder group to input into the discussions. 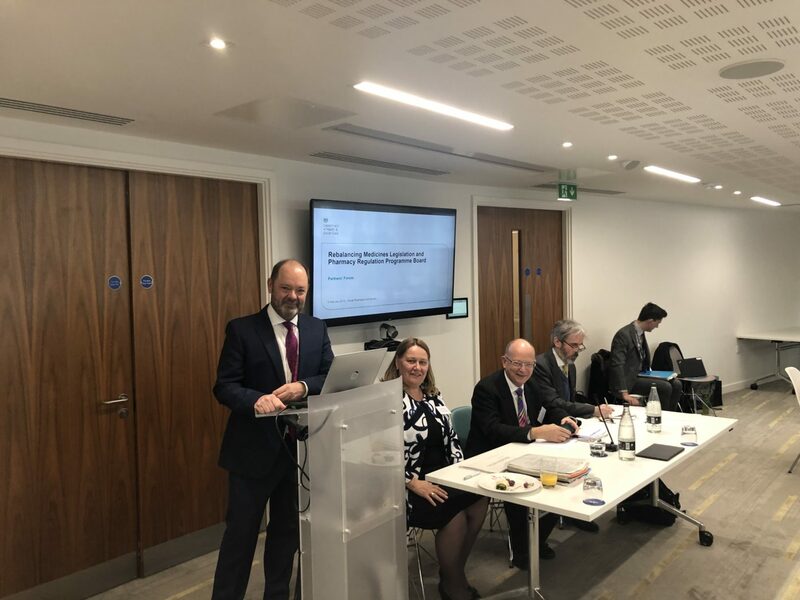 With a wide range of organisations represented and in attendance – the 4 Chief Pharmacists, Pharmacy Regulators, Medicine Regulators, PDA, Pharmacist and Pharmacy Technician professional bodies and patient and public representatives, I had anticipated a lively and spirited debate – I was not disappointed. The work of the Board has been, at times difficult, with delays being imposed by General Elections, Scottish Referendum, EU Referendum and various ministerial changes. However I was pleased that recently we were able to see an important, and long awaited change get over the line – New legislation to protect community pharmacists from prosecution over dispensing errors has been signed into law, and is now in force. It is intended to encourage a more open culture of error reporting by reducing the fear of criminal prosecution, thereby allowing for pharmacy teams to learn from mistakes. Fostering a culture where health professionals feel able to report errors and learn from their mistakes will support a safer and better service for patients. The proposals seek to clarify the role of the Superintendent Pharmacist as responsible for the overarching system of clinical governance in an organisation and the Responsible Pharmacist as responsible for day to day governance in an individual pharmacy. In the spirit of the work of rebalancing much of what currently sits in the law and is under ministerial control will pass to professional standards and the pharmacy regulator ( GPhC ). For example if a Responsible Pharmacist fails to make an entry in the RP log, they commit a criminal offence…. This is clearly disproportionate and far better to have sensible professional standards around this area. Overall we should view these changes as positive and part of a broader suite of changes which are coming to enable pharmacy to be more agile in its response to a changing health care environment. The proposals clearly define the duties for the SP and RP, with reduced legislative burden on Responsible Pharmacists and greater regulation of Superintendents. Ultimately though they are moving us towards a more patient-centred model of regulation and pharmacy practice.